Fabufacture’s ITAR kits are designed to provide facilities with a ‘straight out of the box’ solution for the identification and control of ITAR restricted items that exist within your facility. Our kits also provide you with the tools that help you to control and enforce the movement of employees and visitors within ITAR designated areas of your facility. Fabufacture’s ITAR kits are designed to provide facilities with a ‘straight out of the box’ solution for the identification and control of ITAR restricted items that exist within your facility. 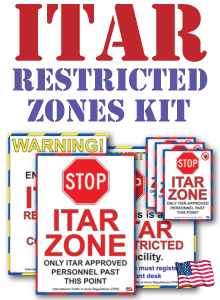 – To clearly identify areas of your facility that may house at any time, ITAR applicable items. These could be for example: products, specific materials, tooling, electronic data, blueprints, BOM’s, work instructions, E-Mail ,etc. – Ensure that escorted visitors and applicable employees are aware of ITAR restricted areas of your facility where the above types of items may be located or being processed. How can Fabufacture’s ITAR kits help you? 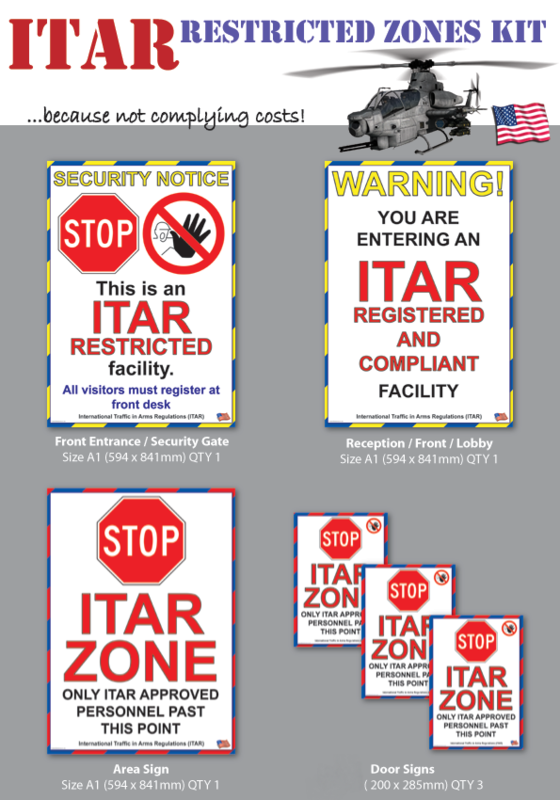 By providing expertly designed and developed ITAR signage solutions, facilities throughout the UK and abroad can strengthen their ITAR compliance greatly. Failing to comply with ITAR regulations carry extremely high financial implementations and prison sentences. If you’re a supplier to the defence industry you probably have heard about the need to be complaint to ITAR (International Traffic in Arms Regulations). ITAR is a set of regulations that ensures that any product that may have a military or space application, or an item that may have “Dual Use” is controlled to prevent its unauthorised import and export. Companies that participate in defence programs that require ITAR compliance need to abide to strict regulations regarding the identification and secure control of all ITAR products and related information. Employees – all employees that are working on ITAR related programs or handling any ITAR related information are legally able to work do so. Technical Information – all technical information regarding an ITAR controlled product must be identified, and have secured access. This includes electronic data, blueprints, BOM’s, work instructions, and E-Mail. Facility – the entire facility must be secured at all point(s) of access, and employee movement must be controlled and monitored. Visitors must be escorted after access is granted. Disclaimer: The products shown above are only intended to be an aid. Installation of any of the above products does not make you or your facility ITAR compliant or approved.